Hoorah! It's raining in Mumbai. And the best way to enjoy rains in Mumbai, is to sit by your window pane, watch the pitter-patter of rain fall, leaning against your window, occasionally sprinkling on your face, touching your soul. Rainfall tunes thousand of emotions in your heart and music in your ears. The tintinabulation is lyrical and musical, leaving melodies in your heart, making you crave, click and off course cook. Yeah, it is not just the melodies that rain transpires in you, it also kindles your appetite and make you crave for some hot, fried snacks like Pakodas [Fritters], Chips, Hot Halwa [pudding] with a cup of Indian Tea. Hot, fried snacks yes. Read Hot, fried and unhealthy! The more unhealthy a snack is, more lucrative it sounds. Read Samosas, Bread pakodas and Onion rings. Yumm, my mouth is filled with water and crave for some fresh baked potato filled Samosas [a deep fried Indian Savory]. But unhealthy it is, it cannot be consumed on daily basis. Me and my father loved eating fried food, especially when it rains. Back in school, we would often associate rains with bowl full of fried fritters and would often cajole my mother to cook it for us. Whenever she refused, we would jump in the kitchen, wear our chef apron and cook up the storm. I so much wish to relive the same moment but unfortunately, my father is now a diabetic patient and has been restricted from eating fried food in general. However, the crave for oily, fried food is still the same in my father and me. I, in spite of my sudden weight mis-management [yes I have gained so much additional kilos in last few years due to my "unhealthy" eating habits], I still love fast food esp the fried variety a lot. The unhealthy quotient is the villain who comes between our food love and lifestyle. Wish there is something I can do about making "unhealthy food, healthier yet tastier option". When Rains kiss the earth, they make it look green and serene. Indeed that is what made Sarang to buy Instamax camera from Flipkart. Well I would have loved to do a photo-walk in rain like good old days. This time, I would also love to click food pictures [may be covering a blog story on different healthy snacks during rain]. So why not acquiring a device that incorporates both- Snacks for monsoon and healthy eating for monsoon. Isn't it amazing? Well now me and my father can indeed enjoy the rains with our junk food-cook in healthy manner. So Philips Air fryer it is. 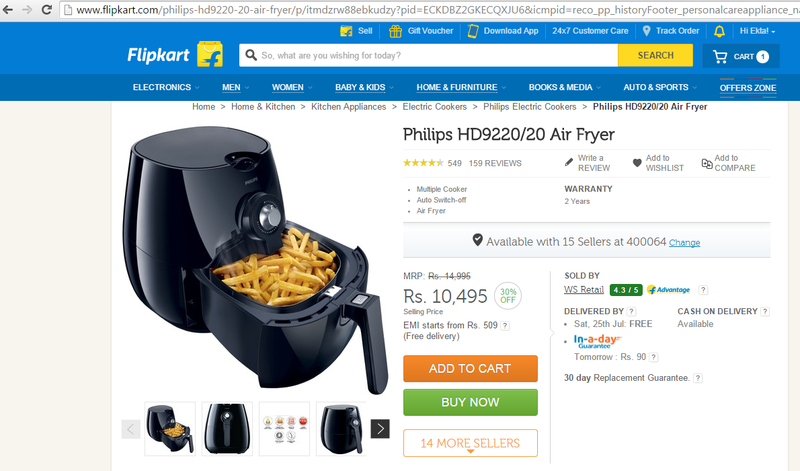 I have checked different food fryer options in Flipkart and post the comparison, I added it to my "wishlist".